Panels of solid color or non-directional patterns wider than 60" (1525mm) will be manufactured in two pieces for use with a field installed horizontal aluminum "H" channel covering the seam furnished at no additional cost. Woodgrains and directional patterns have vertical grain direction only. Panels of wood grain and directional patterns wider than 60" (1525mm) cannot be manufactured because there isn't a method to secure the vertically installed "H" channel. Colors are representations of solid phenolic material. Refer to manufacturers' color chip samples for absolute color fidelity. Color chips are available from Bobrick on request. Additional colors are available and may be subject to longer lead times and additional charges. *Controlled test; not actual fire conditions. **Untreated HDPE tested without aluminum heat sinc. 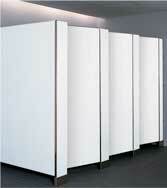 These front views of Gap-Free partition doors interlocking design, open and closed; no sight lines. 72" doors/panels, 4-5/16" floor clearance. Standard or Optional Full-Height hardware. 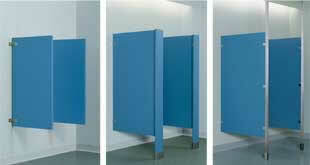 Coordinate urinal, entrance screens, shower dividers and dressing compartments with toilet partitions. 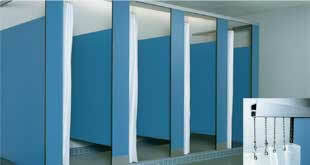 Select Solid Color Reinforced Composite or Solid Phenolic for wet areas.